Tuscarora stronghold. 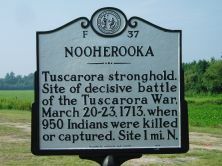 Site of decisive battle of the Tuscarora War, March 20-23, 1713, when 950 Indians were killed or captured. Site 1 mi. 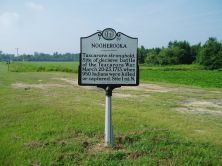 N.
Under the directon of David Phelps, East Carolina University students map the locations of artifacts at the Nooherooka site.